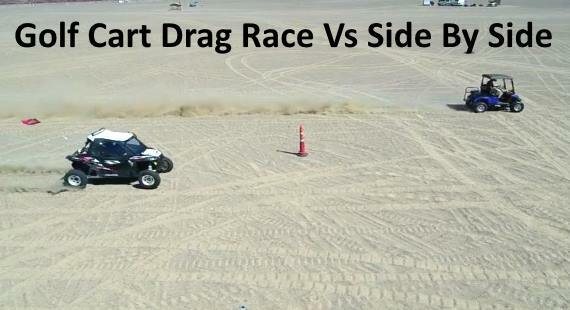 Golf Cart with a Suzuki GSXR-750 motor takes on a Polaris RZR XP Turbo side by side in a 1/4 Mile dirt drag race. The two off-road vehicles go at it in a best of three to decide who is the champ of this piece of desert sand. The golf cart is putting nearly 130hp to the ground where as the Polaris RZR XP Turbo comes to the fight with 145hp. Set back and watch these to over powered dirt rats go at it. The quadcopter give use a nice overhead view or the action. The racing took place in the Dumont Sand Dunes. This is an area of the Mojave Desert containing large sand dunes, located approximately 31 miles north of Baker, California on California State Route 127.